Vern Albert Hinshaw1,2,7,8,10,11,12,13,14 [Vernon Albert Hinshaw9, Albert Vernie Hinshaw3,15,16]. 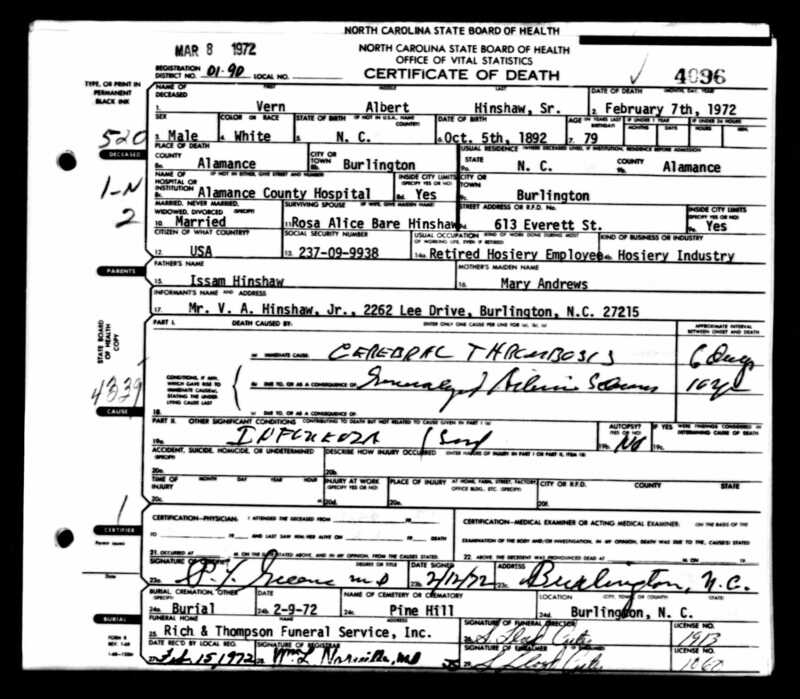 Born Oct 5 18921,2,8,12,14,15,16, Snow Camp, Alamance County, North Carolina1,2,8,12,14,15,16 [Chatham County, North Carolina11]. Hinshaw, V.A., head-of-household, age 27, born in North Carolina; parents born in North Carolina; owned home; occupation: farmer, home farm. Hinshaw, Allis R., wife, age 23, born in North Carolina; parents born in North Carolina. Hinshaw, Olene M., daughter, age 3 years ? months, born in North Carolina; parents born in North Carolina. Hinshaw, Almer D., daughter, age 1 year ? months, born in North Carolina; parents born in North Carolina. Hinshaw, V.A., head-of-household, age 37, born in North Carolina; parents born in North Carolina; first married at age 23; owned home ($3500 value); no radio in home; occupation: carpenter, hosiery mill; not a veteran. Hinshaw, Alice, wife, age 32, born in North Carolina; parents born in North Carolina; first married at age 18. Hinshaw, Olene, daughter, age 14, born in North Carolina; parents born in North Carolina; attended school. Hinshaw, Alma, daughter, age 11, born in North Carolina; parents born in North Carolina; attended school. Hinshaw, Lucile, daughter, age 8, born in North Carolina; parents born in North Carolina. Hinshaw, V.A. Jr., son, age 6, born in North Carolina; parents born in North Carolina. Hinshaw, Eunice, daughter, age 3 years ? months, born in North Carolina; parents born in North Carolina. Hinshaw, Henley F., son, age ? months, born in North Carolina; parents born in North Carolina. 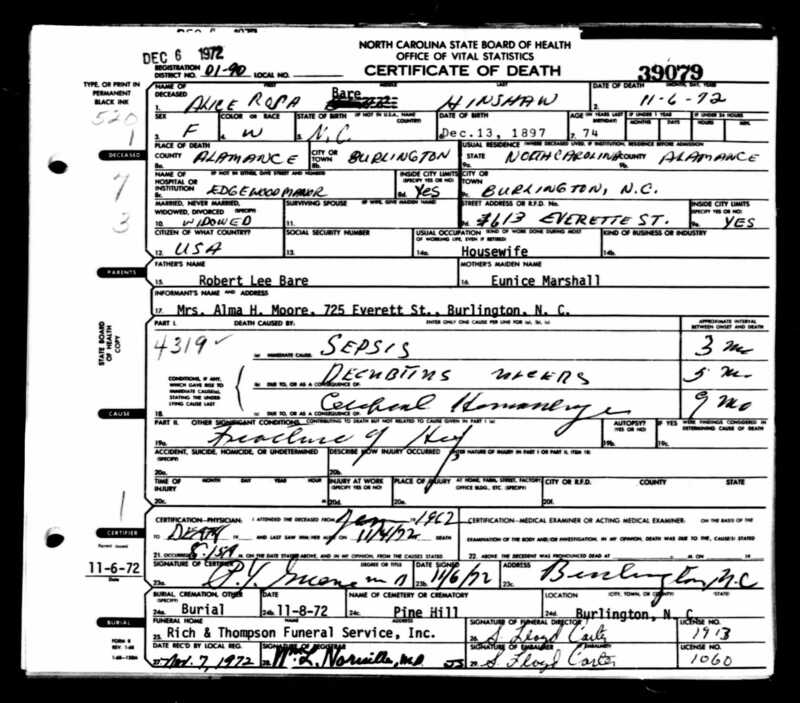 Hinshaw, Albert V., head-of-household, age 46, born in North Carolina; completed 8th grade; owned home ($3000 value); on Apr 1 1935 was living in the same house; occupation: shipping [..unclear..], hosiery mill; worked 46 weeks in 1939, $1600 wages in 1939. Hinshaw, Alice, wife, age 42, born in North Carolina; completed 8th grade; on Apr 1 1935 was living in the same house. Hinshaw, Olene, daughter, age 23, born in North Carolina; completed 9th grade; on Apr 1 1935 was living in the same house; occupation: pairer, hosiery mill; worked 46 weeks in 1939, $980 wages in 1939. Hinshaw, Albert V. Jr., son, age 16, born in North Carolina; completed 1 year of high school; on Apr 1 1935 was living in the same house. Hinshaw, Eunice C., daughter, age 12, born in North Carolina; completed 7th grade; on Apr 1 1935 was living in the same house. Hinshaw, Hurley, son, age 10, born in North Carolina; completed 5th grade; on Apr 1 1935 was living in the same house. Vern's obituary was published in the "Times-News" (Burlington, North Carolina) on Tuesday, February 8, 197211 (see scan below). Alice's obituary was published in the "Times-News" (Burlington, North Carolina) on Monday, November 6, 197218 (see scan below). 1920 census, Newlin Township, Alamance County, North Carolina; roll T625-1282, ED 12, page 8B, line #54, dwelling #155, family #155. 1930 census, 4th Ward, Burlington, Alamance County, North Carolina; roll T626-1671, ED 22, page 14A, line #4, dwelling #240, family #306. 1940 census, 4th Ward, Burlington, Alamance County, North Carolina; roll T627-2869, ED 1-27, page 23B, line #63, household #438. Obituary of Larry Lamar Hinshaw. Vern Albert Hinshaw & Alice Rosa Bare golden wedding anniversary. Contribution from Connie Marshall Thompson (). "Times-News" (Burlington, North Carolina), Feb 8 1972; http://www.ancestry.com. 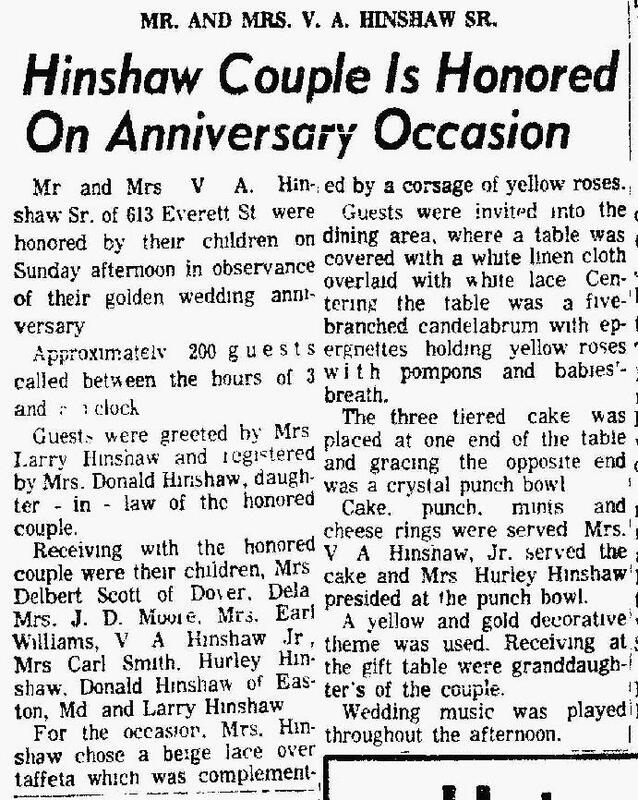 Vern Albert Hinshaw & Alice Rosa Bare wedding anniversary; "Daily Times-News", Jul 30 1965; http://www.ancestry.com. "Times-News" (Burlington, North Carolina), Nov 6 1972; http://www.ancestry.com. 1920 census, Newlin Township, Alamance County, North Carolina; roll T625-1282, ED 12, page 8B, line #58, dwelling #156, family #156. 1930 census, 4th Ward, Burlington, Alamance County, North Carolina; roll T626-1671, ED 22, page 14A, line #1, dwelling #239, family #305.